Victor Hanescu was fined for spitting and "not using best efforts at the conclusion of the match," Wimbledon officials said. 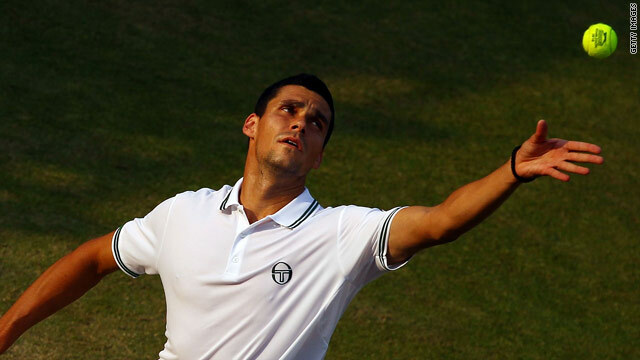 (CNN) -- Romanian tennis player, Victor Hanescu has been fined $7,500 by Wimbledon officials for spitting towards spectators during his third round match against German, Daniel Brands. The 28-year-old was fined a further $7,500 for walking off court having completed only three games of the fifth set. Championships referee, Andrew Jarrett said in a statement, Saturday: "Following a review conducted by the Championships' referee in association with the Grand Slam supervisors into the incident on Court 18 yesterday evening, the player Victor Hanescu has been fined $7,500 for unsportsmanlike conduct and a further $7,500 for not using best efforts at the conclusion of the match." Hanescu took the opening two sets of the match, played on Friday, before his opponent fought back to square the match at two sets all. Having lost the opening two games of the final set, Hanescu then lost his temper with a section of the crowd who were allegedly heckling him and appeared to spit in their direction. Shortly afterwards, he resumed his service game serving a succession of double faults to hand Brands a 3-0 lead. Hanescu, the tournament's number 31 seed, then walked up to the umpire and conceded the match. Afterwards, four young men from the crowd on Court 18 -- scene of John Isner and Nicolas Mahut's marathon battle earlier in the week -- were arrested by the Metropolitan Police under section five of the UK's Public Order Act. Scotland Yard said Saturday that the four arrested men, three aged 30 and one aged 29, had been bailed pending further enquiries by officers, the BBC Web site reported. The $15,000 fine will be deducted from the $47,000 prize money Hanescu earned for reaching the third round. Hanescu has ten days to decide whether he wishes to appeal the punishment.